At one time oral cancer was predominantly seen among smokers, however, increasingly, oral cancer is being seen in patients of all ages. Although smoking is still the leading factor, many other criteria such as age, family history, ethnicity and alcohol consumption also play a role. Many experts have surmised that an increasing cause is exposure to the HPV virus, which is the primary precursor of cervical cancer. Recently however 25% of all newly diagnosed cases have been in patiens under the age of 40 with none of the known risk factors. Oral cancer is one of the few cancers whose survival rate has not improved in the past 50 years. This is primarily due to the fact that during this time we have not changed the way we screen for this disease. Traditionally, oral cancer screening consists of a visual and manual examination of the oral Cavity, head and neck but recently we incorporated a breakthrough technology that will allow us to see things we've been unable to see previously. A new technology, the VELscope has received FDA approval. The VELscope will help pinpoint and identify suspicious tissue at earlier stages before they may become life threatening concerns. VELscope, similar to other detection procedures such as colonoscopy, mammography, PAP smear and PSA exam, is painless and non- invasive, uses fluorescence visualization to identify oral abnormalities at the earliest stages. 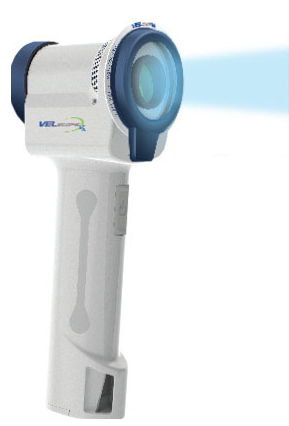 The VELscope technology is based on the direct visualization of tissue fluorescence and the changes that occur when abnormal cells are present. Typically, healthy tissue appears as apple green, while the suspicious areas are identified by a loss of fluorescence, which then appear dark. 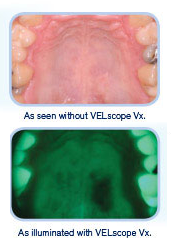 VELscope utilizes a narrow band of safe, high-energy blue light and specialized filtering technology to help thoroughly evaluate the oral tissue for abnormal areas of concern that may not be evident under white light. These detected changes can range from something minor to something of greater concern that may require further examination and follow-up. As we care about your health as well as your teeth, we believe that this new technology will assist us in detecting disease at early stages and therefore catch abnormalities before they turn into a more serious condition. For these reasons, it is recommended that all individuals over the age of 14, or anyone who is sexually active, should have at least an annual comprehensive oral cancer examination, and ideally at every dental hygiene visit.